He started out producing posters for the cinema; now we produce posters for him. Who he? Antoni Clavé: possibly the greatest twentieth century artist you have never heard of. But now you can witness the genius of this artist – contemporary, compatriot and friend of Picasso, at the Musée Rigaud in Perpignan, until the 12th May. Don’t like abstract impressionism – no worries – he also produced wonderful figurative art; don’t like painting – no worries he created fantastic sculptures too, including strange musical instruments. Love colour? 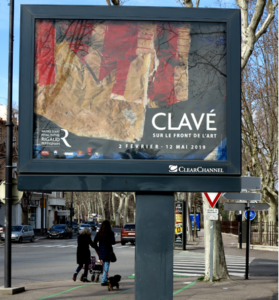 Then you will love the big format creations of Clavé. What a guy and, I (your humble arts and culture correspondent) must admit, I had never heard of him before either! So why have a huge exhibition of his work in Perpignan? There’s a connection – In 1939 he was one of the many thousands of Spaniards who had to flee from the forces of Franco (the “retirada”) and he ended up in a camp near Perpignan, where his artistic talents were spotted by local artist Martin Vivès, who obtained his liberation. Clavé went on to be a big hit in Paris, where he stayed until 1965, when he moved back down south. He went on creating magnificent works right up to his death in 2005.